Going beyond cage-free eggs, the Colorado-based retail chain adopts minimum free-range standard. Like many other areas of the grocery store, the egg case is littered with unhelpful claims, from hormone free (it’s illegal to give hormones to egg-laying hens) to vegetarian-fed (even though chickens are omnivores ) and probably most commonly at this moment, cage free. While big-box restaurants and grocers adopt policies to buy and sell only cage-free eggs—which come from hens that weren’t required to have access to the outdoors—natural products retail may have an opportunity to educate and lead the way toward more humane standards. As a first step to addressing the misconceptions around cage-free eggs, and leading consumers to what it thinks is a better option, Natural Grocers by Vitamin Cottage recently announced that it won't sell eggs produced below free-range standard. That right thing, according to the retailer, is to ensure that egg-laying hens have at least 2 feet of outdoor space to express natural behaviors and thrive. Brunnquell says he commends the retailer for being the first to say that birds must go outside as a minimum standard. 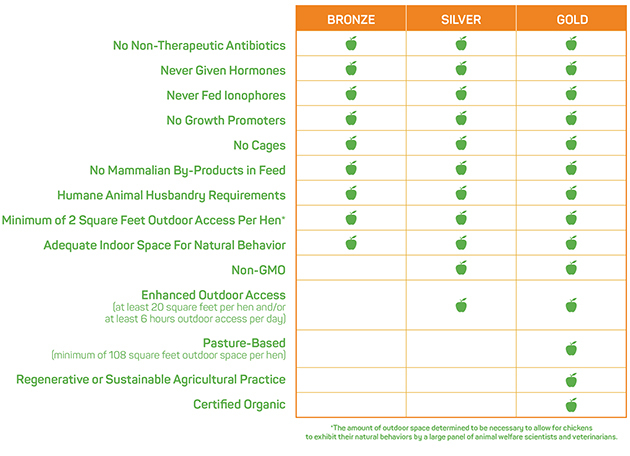 When Natural Grocers first decided to make the switch from a cage-free minimum standard to a free-range one last year, it built a questionnaire that it sent to all of its producers. It took their feedback about their practices, and also looked at Certified Humane’s standards for egg-laying hens, to guide the creation of its own new standard. Suppliers that didn’t meet the new standard were offered the opportunity to work with the retailer to make some changes, and Clinthorne says many of them did. Interestingly, others revised their packaging, because their practices actually met the free-range standard but their packages were labeled “cage free” because of consumer awareness of that label. Still, with the introduction of the new standard, the grocer lost some of its lowest-priced eggs. But Clinthorne says it was able to expand its national egg program so that it could produce large enough quantities of free-range eggs to get them back down to the lower prices. Now, it waits to see how shoppers respond. As part of its education campaign around the new standard, and the ranking system that accompanies it, most Natural Grocers stores have space taped off on the floor to indicate how much space is given to chickens raised in battery cages, cage-free and free-range environments. “That visual communication is so powerful to people,” Clinthorne says. As for other food labels that consumers care about, like non-GMO and organic, Natural Grocers says it addresses those through its new egg quality ranking system. Bronze-level eggs are the store’s minimum standard; silver adds non-GMO feed into the equation, and gold-rated eggs are organic and certified pasture-raised. 5@5: The complicated path to cage-free eggs for all | Which country is second to U.S. in organic food sales?